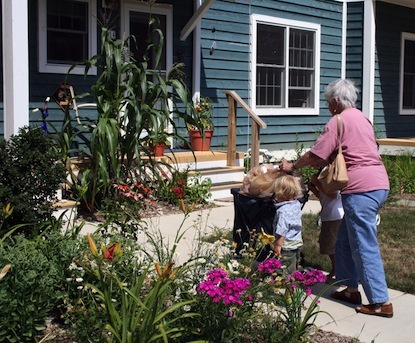 Cohousing is a growing concept of “old-fashioned neighborhood” where residents honor differences, know and support each other, and gather frequently for dinners, spontaneous conversations and fun. 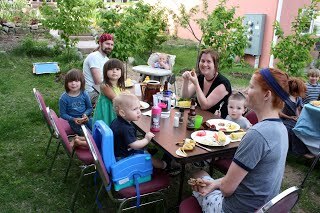 People in cohousing are creating the feeling of a large extended family within their neighborhoods. Touchstone is a sustainable community, which utilized special design principles, innovative building materials and special technologies to create a neighborhood that makes a smaller footprint on the Earth. All of our homes are cost-effectively designed, built and operated to achieve energy efficiency, improved indoor air quality, occupant health, resource efficiency and environmental compatibility. Touchstone adds value in an innovative way by providing continuing education for group facilitation, conflict management and communication. 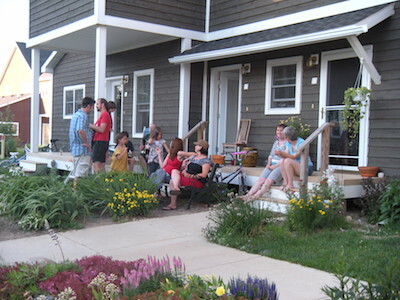 Cohousing is a village-like neighborhood where people know and support each other. Ours is a group of privately-owned condominiums. Vehicles are parked on the perimeter, and wide pathways within the neighborhood are walkways, gathering spots for conversation and play areas for children. The neighborhood is at the end of a dead end road and is very quiet, with shopping along Jackson Avenue from Zeeb Road to Maple Road only minutes away. 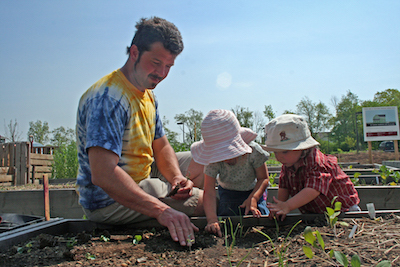 There are actually three Ann Arbor Cohousing communities neighboring each other: Touchstone, Great Oak, and Sunward. The entire community watches children. It is safe for them to play outside. Spontaneous child care and play dates are common. Group meals are prepared 4-5 times weekly at the Great Oak common house for those who wish to participate. Neighbors are available in emergency situations or when you are missing ingredients for cooking. Residents have chosen to live a more environmentally sustainable lifestyle. Examples: We consume less energy with energy-efficient dwellings, have composting and recycling available on-site, share rides and large equipment such as lawnmowers and a play structure, and use only fragrance-free laundry products. Homes meet the standards of Energy Star ratings. To get this rating an energy audit must show a rating of 85 or below. Two of our units were tested and achieved ratings of 77 and 73. An EPA study of Nyland, a cohousing neighborhood near Denver the size of Touchstone, showed utility bills were half those of neighboring homes. 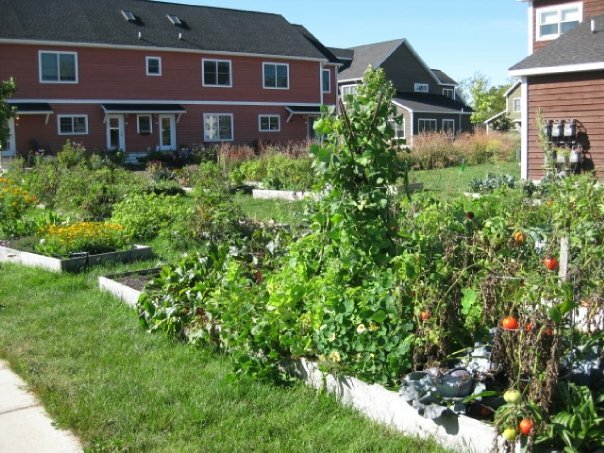 More than half of the 35 acres owned by Ann Arbor’s three cohousing neighborhoods located next to each other are preserved in a natural state with two ponds, a greenbelt of native plants and prairie, plus a woods. At Touchstone people buy a lifestyle as well as a home. Residents contribute a few hours of their time each week for neighborhood maintenance and other jobs, attend meetings twice monthly where decisions are made by consensus. Our neighborhood is a balance between community involvement and personal privacy. We designed homes with kitchens in the front, porches and front doors of glass. Sitting on your front porch lets people know that you are available to socialize. If your front door window is covered, it is a signal that you do not want visitors. An uncovered window encourages others to ring your doorbell. Interaction and conversation take place while we are outdoors walking to our cars, picking up mail or simply strolling in the neighborhood. People often ask me why I moved to Ann Arbor. My answer often causes questioning looks when I reply that I moved here for Cohousing. I had read an article about Cohousing in a national magazine. My immediate reaction was, “Cohousing is where I want to live. 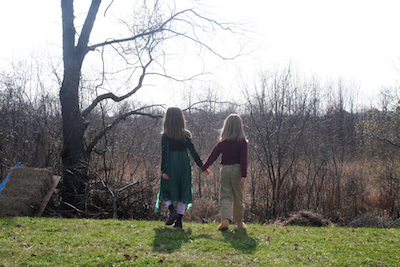 I checked the existing communities nationwide and decided to move Touchstone in Ann Arbor. I have never regretted my decision. Let me tell you about a day in my life here. I leave my home to take a walk around the community. I have a meal for a neighbor who has returned from the hospital. Another neighbor is walking her two little dogs. I pet them as she and I talk briefly about last night’s business meeting and check our ideas for the next meeting of the Work Committee which we both are on. Several children are playing together, having great fun on the new play structure with its many opportunities for climbing, swinging and cooperative play. I call “Hi” to them, exchange a couple of hugs and head toward the Common House to check on my jobs. On the way, I admire the common gardens which are in their prime. Several neighbors are working there, watering, picking, weeding and nibbling. One mother, head of the Garden Committee with her young sons playing beside her, is busily picking beans for tonight’s community dinner. I walk into the Common House to check on my jobs for the month. We each work a few hours each month for the good of the community. I see that I am assistant cook for Sunday’s Common Meal with another neighbor, so I stop by her home on the way back. She and her husband are very active in keeping us on an even keel. 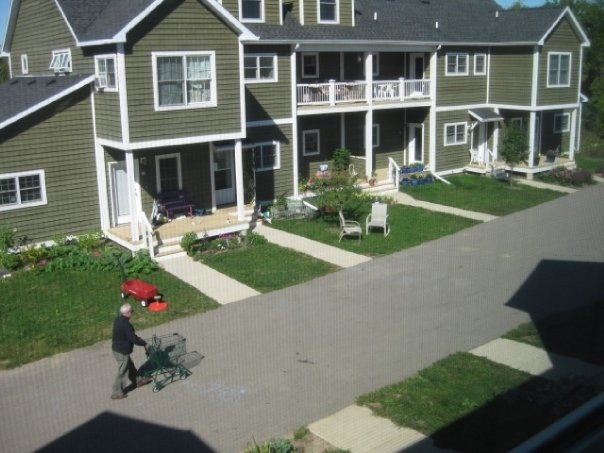 In fact, he is chair of the Grounds Committee and is out checking that the mowers are in good working condition. She and I discuss dinner plans, I pet their dog and head back up the hill. I hear frogs singing in the retention pond, as geese, honking, fly overhead. Two of our older boys skim past me on their roller blades, knowing they are safe since no cars drive within the perimeter of the buildings. Standing on the porch of my home I look around and feel great satisfaction with my life, sharing it with so many friends of all ages at Touchstone.